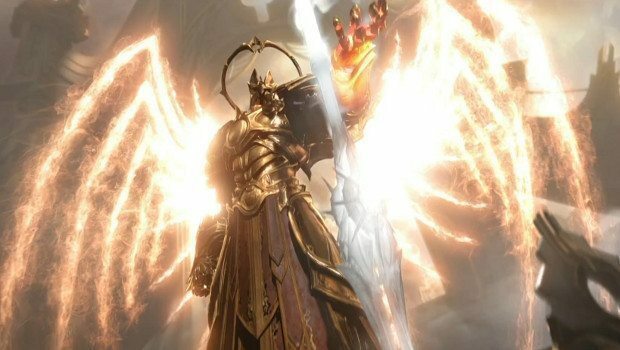 Because I promised you some Diablo Know Your Lores, today we’re looking at the origins of the world of Sanctuary, the mortal realm that has seen the machinations of the Prime Evils as well as near-extinction at the hands of Malthael, the former Archangel of Wisdom and current Angel of Death. Well, I say current, but it’s hard to determine if that’s the case — can Death die? Indeed, Sanctuary’s very name is related to the eternal conflict between the angels and demons, because its creation was intended to be exactly that. It was the hoped-for escape, the sanctuary for those angels and demons that had tired of never ending conflict. Before the angels or demons existed, there was divine Anu — Anu who predated creation itself, whose entire world was a single point of existence bound within a cosmic pearl. That pearl was all of creation — outside there was true nothingness, a void so utter and complete that it defied definition. It simply wasn’t, and all that was lived within the boundaries of the pearl. All that was, was Anu. Anu sought perfection. In this ur-state, Anu was light and darkness, good and evil, chaos and order. Anu was all things. But Anu saw itself as flawed, imperfect by the fact of its completeness – by being all things at once, could Anu truly be anything? How could a being be said to exist in utter opposition to itself? Anu sought perfection. Anu sought purity. And so, as a light casts a shadow, so did Anu cast out all things repellent – all evil was expelled from Anu, who became the perfect force of light, a living diamond without a flaw. At last Anu had definition — Anu was all things good, perfected and pure. Anu knew what Anu was, because Anu could point to the things Anu was not. But those things were not content to be cast out and rejected. In the time before creation, all things were drawn to each other, and so it was with this evil. It rose, united, as Tathemet the seven headed dragon, the Prime Evil. And Tathemet would bring war to the pearl that was all of existence, as for the first time good and evil existed in separate beings. Anu soon found itself equally matched — for just as Anu was all things of good, Tathemet was all things evil. And in their conflict came the destruction of the pearl that was the cosmos entire, and the destruction of each other, as each dealt the death blow to the other. From this destructive blow also arose all of existence — all things known and unknown, all things from the stars to the void. The immediate creation of Pandemonium resulted in this moment of cosmic destruction, as the essence of purest evil and good were scattered into the void. At the center of Pandemonium (if it can be said to have a center) lay the Eye of Anu, a remnant of that entity, an artifact with a fragment of his enormous power. Also created were the High Heavens and the Burning Hells. The High Heavens came into existence around a fragment of divine Anu, believed to be the diamond warrior’s spine — as it came to rest amidst the void. It became known as the Crystal Arch, the birthplace of the angels who would create the Silver City around it. Meanwhile, the essence of the seven headed dragon was torn asunder by the destruction of Tathemet, and the Burning Hells were born. In time, the Hells would come to be ruled by the seven Great Evils, mirroring Tathemet’s seven heads (whether in imitation or due to the nature of existence is unknown). And the angels and demons looked across creation at each other. And the conflict of good and evil was reborn. Now, instead of two beings contending in a pearl, armies would clash across the plains of Pandemonium, endlessly grinding each other into the plain’s substance in a conflict that transcended mere ideology. There could be no peace or end for this conflict, just as there had been no such peace or end for Anu and Tathemet: each was utterly inimical to the other, each was utterly opposed to the other. This war was eternal. But remember: before Anu cast Tathemet out, there was but one being, one unity. We look to the Book of Cain here, for it mentions something important. Evil and good aren’t truly opposites. Seeking a state of total purity and perfection, Anu cast all evil from itself. All dissonance was gone. But what of the cast-off aspect of its being? The dark parts, the sharp, searing aspects of hate and pridefulness? Those could not remain in a state of separation, for all things are drawn to all things. All parts are drawn to the whole. All things are drawn to all things. The Eternal Conflict exists in part because evil and good are drawn to each other. They fight because they are divided, forced into a state of opposition by Anu’s choice, but they are inherently parts of a greater whole, and there is that cosmic force that seeks to unite them. At the center of Pandemonium lay the Eye of Anu, a massive jewel that, whether by virtue of its link to the now-vanished divine being or its position at the heart of the conflict that created all existence possessed great power. The Eye of Anu would become known as the Worldstone, because it could indeed make worlds. The forces of the High Heavens erected the fortress to safeguard the Eye, and in time it became the ultimate prize in the war between the demons and the angels — one side would conquer the fortress and hold it for a time, and then the others would claim it in turn. Inarius was an angel. He was considered once of the Angiris Council, although his portfolio is unknown, but what is known is that Inarius grew disenchanted with the endless war against the demons. In a way, the Pandemonium Fortress served as the ultimate reminder of the futility of the war. Inarius could not convince the council, however, not even his close friend Tyrael, and so he brooded, with no answers forthcoming. Until he met Lilith. Sometimes counted among the Lesser Evils (the demons directly below the three Prime Evils in power and influence), Lilith was the daughter of Mephisto and a powerful demon in her own right. While Inarius was jaded, no longer certain of the worth of the conflict, Lilith simply didn’t think it was winnable in the current state of affairs. Direct military conflict didn’t seem to be accomplishing anything and there wasn’t much point to endlessly squabbling over a patch of ground as utterly trod upon as Pandemonium was. She and Inarius met when that angel was captured by a demonic host, and she freed him for her own reasons. She saw in Inarius a bit of a kindred spirit, one as tired of the war as she was. But she was a demon, after all, and for her there was no soul searching, no doubt in herself and the worth of her cause. She just sought a different means to her ends. Over time, Inarius and Lilith convinced others to join them. But they realized that as things stood, they would ultimately be hunted down by the forces of Heaven and Hell. What they needed was a refuge, a sanctuary where they could hide. A world of their own. And then Inarius remembered the Eye of Anu. When we continue this series, we’ll look at how Sanctuary came to be, and the origins of humanity.